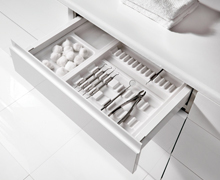 Designed, engineered and manufactured by Häfele, the MX soft-close drawer system delivers smooth, elegant movements with a premium finish. 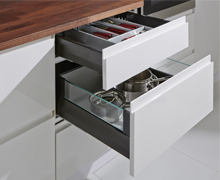 Extremely versatile, the MX drawer system is suitable for a variety of domestic and commercial applications, like Kitchens, Bedrooms, Office Furniture and Laboratories, making it an ideal choice for manufacturers, installers, designers and customers alike. Häfele engineer and test products to LGA standards and are now proud to offer Lifetime Guarantee of 25 years on the entire MX range. Find out more about the guarantee here.